The Phillies announced a series of transactions today. Two have 40-man roster implications. The club selected the contract of infielder Sean Rodriguez and designated reliever James Pazos to make way. Joining Rodriguez on the active roster is righty Enyel De Los Santos. To create space, infielder Mitch Walding and righty Drew Anderson were optioned back to Triple-A. Rodriguez turns 34 on Friday, so this makes for an early birthday gift. He’s in the starting lineup today at shortstop, representing his first MLB action since he was designated last August by the Pirates. Rodriguez has struggled at the plate in recent seasons but is off to a .267/.327/.622 start with the bat at Triple-A. He’ll help fill in while Jean Segura is sidelined. As for Pazos, who’s closing in on his 28th birthday, it seems the Phillies have been quite underwhelmed since receiving him via trade over the winter. He was a quality relief piece in 2018 and has plenty of cheap control remaining, but had struggled badly in a Phillies uniform. Over 14 2/3 innings between Spring Training and the start of the Triple-A season, the southpaw has managed just six strikeouts against 11 walks. Phillies right-hander Nick Pivetta sat down with The Athletic’s Meghan Montemurro for a candid interview about the difficulty of being optioned to Triple-A and the path he knows he needs to take back to the Majors (subscription required). The 26-year-old expressed disappointment in what he felt was “an early send-down,” though he made clear he respects the decision and understands what he has to improve upon to return. The Phils made no promises about the length of his minor league stay, Montemurro notes, suggesting that Pivetta’s fate is largely in his own hands. 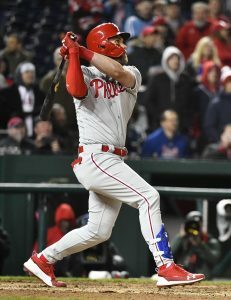 Perhaps most interestingly, Pivetta spoke about the emotional conflict of being sent to the minors and having his job taken by close friend Jerad Eickhoff. “That’s the brutality of what is baseball,” Pivetta explained. “Your best friends and guys that have really helped you out, they come up and they take your jobs and you can’t feel hardship against those guys because they’re your friends. … The road he had to come back is extraordinary and it’s a feat and it’s a great thing for him. So I’m not ever going to feel down about that.” The interview serves as a good reminder of the oft-overlooked human component of roster transactions we see on a daily basis. It still isn’t clear what’s going on in the inflamed elbow of Phillies righty Victor Arano. He’s due soon for an MRI, but first needs an ultrasound to assess what precise type of imaging to pursue, manager Gabe Kapler tells reporters including Scott Lauber of the Philadelphia Inquirer (Twitter link). The 24-year-old Arano had been off to an interesting start to the season, racking up seven strikeouts against two walks in 4 2/3 innings with an eye-popping 25.0% swinging-strike rate. It’s a small sample, to be sure, but nevertheless a promising development for a young reliever who already showed ample promise last year. He and the Phillies will obviously hope that the elbow issue turns out to be minor.